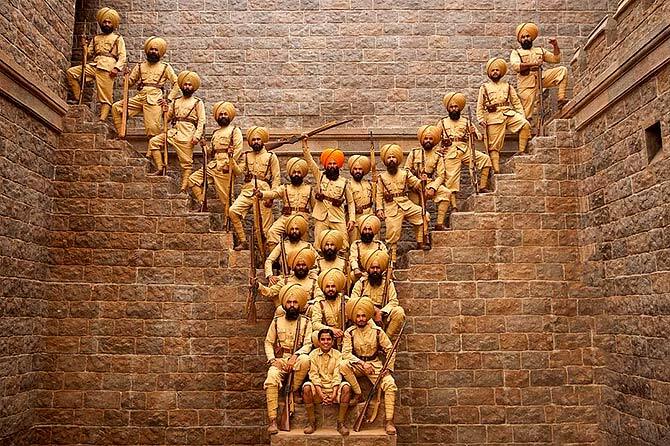 IMAGE: Akshay Kumar in Kesari. Akshay Kumar is on a mission. He wants everyone to know about the historic Battle of Saragarhi, where 21 Sikhs fought 10,000 Afghan invaders. He wants this to be introduced in history books in schools, so that children know about this stirring story of bravery. His new film Kesari focuses on this battle. Directed by Anurag Singh and starring Parineeti Chopra in a cameo, the film is spread over over two days of the battle. "Just google the five biggest battles fought and you will see that number two is the Battle of Saragarhi. And we have not made even a single film on that! 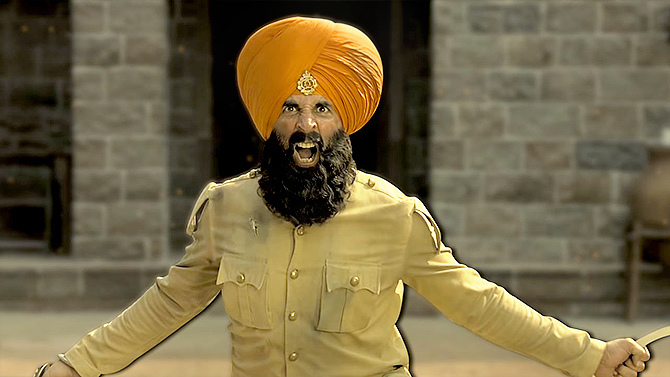 Imagine fighting a battle where you know that you are going to die," Akshay tells Rediff.com Contributor Mohnish Singh. There are media reports saying, 'Move over Khans, 2019 is the year of Akshay Kumar'. What move over Khans or anybody? This industry is for everybody; everybody is here to last. To be in this industry and sustain is a very big thing. What fascinated you about Kesari? First all of, we were fascinated with the fact that somebody made a film called 300 in Hollywood, which is a fictitious story. It is not true that 300 people faced 8,000 Persians. But here is a true story of 21 Sardars facing 10,000 invaders. Now, who will not get fascinated with a story which is so strong and real? Just google the five biggest battles fought and you will see that number two is the Battle of Saragarhi. And we have not made even a single film on that! Not many people know about it. Even I knew only a few things, that there were 21 Sardars who fought against 10,000 invaders. But as I went into it, I found out so much about it. My director, who is also the writer of the film, told me what exactly had happened. These people had the chance to run away and forget about their country, but they did not do it. They knew they were going to die. Imagine fighting a battle where you know that you are going to die! I consider myself very lucky to get this film. I would plead to parents to take their children to theatres and show them the film. They should know what their ancestors have done for their country. I dedicate this film to all the martyrs of all the countries in the world. Is it true that you went to your mother to seek her blessings before starting the shoot? I had gone to show her my look and she was very happy. She said, 'Come and click a photo with me.' That's all. Yes. Shooting on that terrain was difficult. We shot in Spiti, where there is less oxygen because of the higher altitude. You need at least three days to acclimatise. If there is a retake, you will have to take a break of at least 10 minutes to catch your breath. Plus, the turban I wore weighed around 1 kilo. My sword weighed six, seven kilos. But it was nothing compared to the swords those brave Sardars used during the battle. Their swords used to weigh 25, 26 kg because they used to eat pure ghee and our generation eats pure steroids (laughs). Was it necessary to shoot in such a location? We chose Spiti because we wanted a location which would match the year 1897. We wanted hills overlooking huge mountains, clad with snow. Spiti was the only location which matched the original location. We had also created a set in Wai which, unfortunately, got burnt down. Was there a feeling of patriotism while playing Havildar Ishar Singh? Yes, the film demands that. I am quite emotionally involved with this film. My father was in the army, so I get emotionally attached to anything that has to do with the uniform. 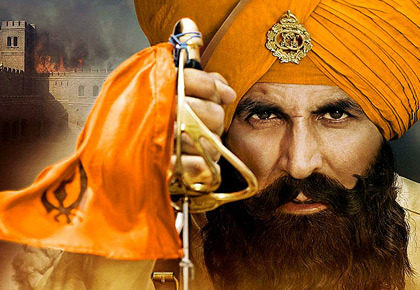 Kesari is releasing at a time when national sentiment is very sensitive in the wake of the Pulwama attack. See, I did not plan this (the release of the film). I had announced the release date a year in advance. It just coincided with that (Pulwama attacks). Will the audience relate better to the film? I made the film for them. It is a film very close to me. It's an honest film. It is not a story with a lot of twists and turns. There is very little romance. It is very brave of Parineeti (Chopra) to come and do this role, knowing that it's not big. Did you choose the director or did the director bring this film to you? Karan Johar and I got the director. Anurag Singh is a National Award-winning director. I know him very, very well. He was an assistant director when I was working with (film-maker) Raj Kanwar (Kanwar directed Akshay in films like 2003's Andaaz and 2006's Humko Deewana Kar Gaye). I know him since then. He is a well-informed man. I remember he used to write even when he was an assistant. IMAGE: Akshay with Nimrat Kaur in Airlift. Why do you think such a powerful story is never taught in schools? Yes, such stories are not in our history books. History is so vast, but they never thought of including this story in books. In Britain, they celebrate Saragarhi Day. We should also do that. I hope people will now know more about the Battle of Saragarhi. Nobody knew about Air India's evacuation of over 1.70 lakh Indians before Airlift released. When I was offered Airlift, I googled the evacuation and there was only one article available. But now when you google it, you will find so many articles about it. 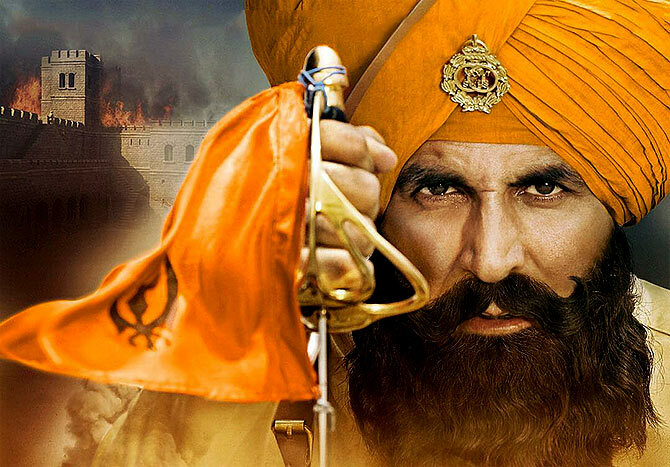 So I hope after the release of Kesari, a lot of articles will come. Already, a lot of articles have been written about what happened on September 12, 1897. What gives you a high: Stunts, romance or comedy? After doing other genres for some time, I keep coming back to do action. 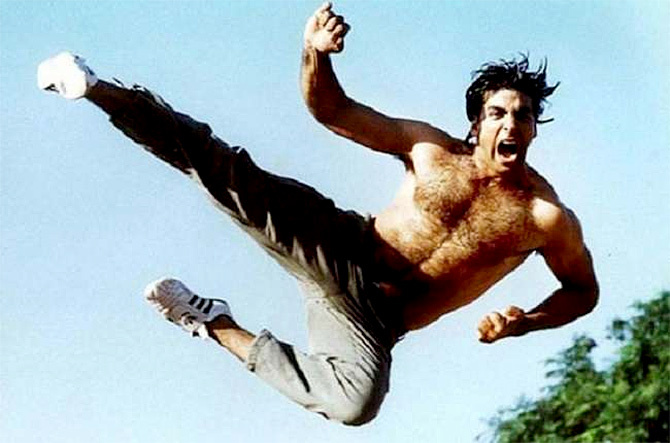 IMAGE: Akshay in one of his earliest actioners, Khiladi. As an actor, how difficult is it to keep reinventing yourself? It is not difficult, it's fun. If I change my image, I do it because I enjoy it, not because I have to prove something. I don't have to prove anything to anybody. It is great to do different characters all the time. You see, I have been scarred. When I started my career, I was doing only action films. Nobody would give me any other role. Nobody offered roles which involved romance, comedy, tragedy or drama. I was stuck with action roles. It finally changed when I got Hera Pheri. Then, I started doing different kinds of roles. I cannot forget those initial days of my career. Whenever I used to come down the lift, I used to look in the mirror, and feel ashamed because I was doing similar kind of films, which involved action. Then, I got an opportunity to change that and I started enjoying work. Since the last 12 years, I have got a chance to keep changing my image as an actor and I enjoy it. 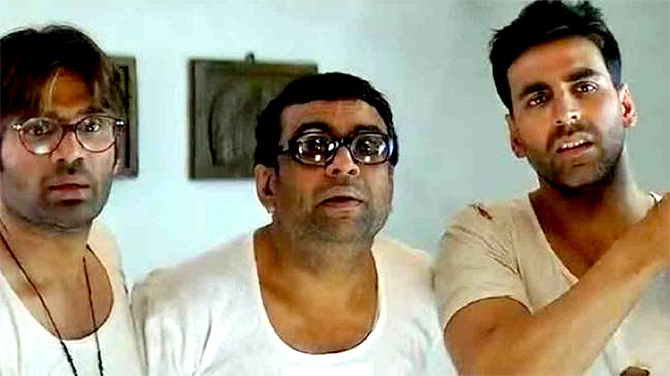 IMAGE: Akshay with Suniel Shetty and Paresh Rawal in Hera Pheri. Any update on Hera Pheri 3? There is nothing to say at the moment. In one of your recent interviews, you said you will do action for another five years. What's next? A body can take so much. I am 51 now. I think I can do action till 56. If I can maintain myself further, I will continue. Otherwise, there are so many other things to do in life. 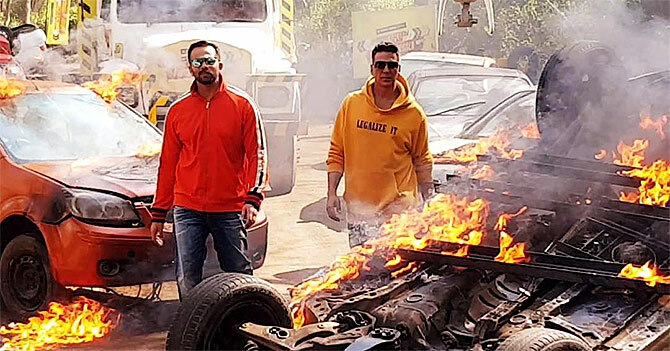 There are reports that you spoke to Salman Khan before blocking the Eid 2020 release date for your next film Sooryavanshi. There are reports that you are doing a horror comedy.